Digital Devices or Electric and Electronic Equipment (EEE) are scrapped at an alarming rate instead of being salvaged, fixed, and reused. For the reuse sector to flourish, donors, receivers and reuse centers need services and technologies to gain effectiveness, efficiency, and traceability to ensure final recycling. In this poster we present a set of open source tools based on a distributed platform ecosystem that enable direct donation of devices. Traceable devices are prepared to be reused in the donor’s location, and receivers are responsible for collecting them. This reduces costs, minimizes EEE losses because there is no need for central logistic or centralizing the engagement of donors on charity projects. 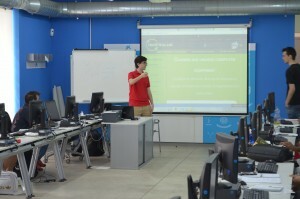 eReuse.org supported by reutilitza.cat reuse platform has trained students from the Trinijove Foundation. 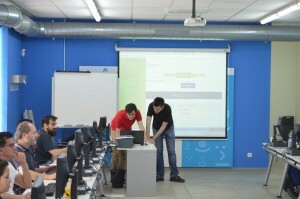 The purpose of the course is to learn how to prepare computers to be reused again offering guarantees recycling and generating new skylls for green employement. ● Register computers and select suitable to be prepared for reuse. ● Preparation for reuse (data erasure, testing and labeling components). current legislation on taxation, legal and environmental. your contract or your services. Reusing working computers is significantly more sustainable than recycling or disposal. In addition it can deliver wider economic and social benefits. The donation of reusable Electrical and Electronic Equipment (EEE) can support social digital exclusion programmes, encouraging the creation of local employment and reducing electronics waste. 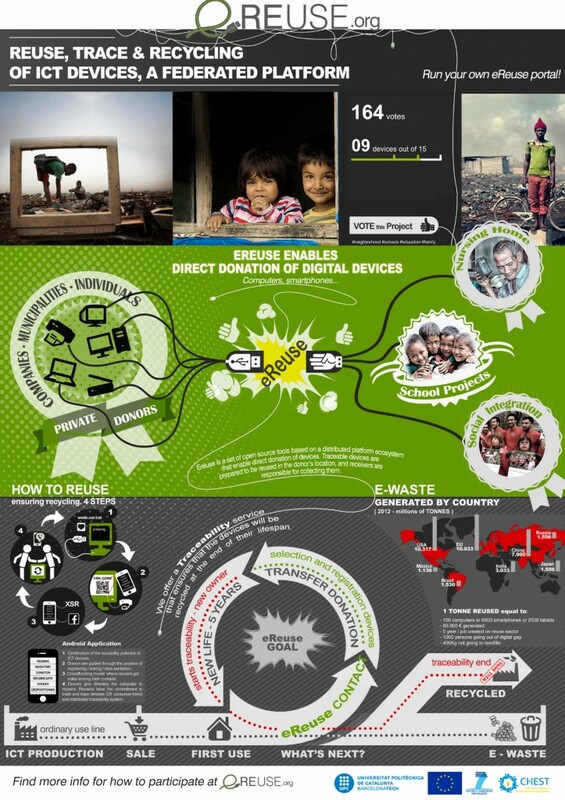 The Computer Re-use initiative proposed by the Universitat Politècnica de Catalunya aims at creating an ‘open community’ around the reuse of digital devices. This includes the development of an integrated set of software tools and online web sites to support the lifecycle of digital devices: from registration and labelling of new devices, preparation (data clean-up, pre-install), matching demand and offer, tracking reuse. We live in a complex world. Social networks and human interconnectedness condition the way we live. Onodo, the open network analysis and visualization platform developed by Civio, will help anyone to better understand complex networks about any issue having an impact on our communities. The project, as proposed by Greater Glasgow and Clyde Health Board, will adopt a partnership approach to create a suite of interactive digital resources, aimed at promoting the mental health and wellbeing of young people – amajor public health challenge area across Europe. Development work will be undertaken in Greater Glasgow and Clyde area of Scotland, with young people involved throughout as active collaborators. The work will also see the development of a toolkit for youth-related workers and their agencies, bringing together resources and learning which will be shared across Europe. The project, as proposed by the Florence based Magenta Software Lab , will conduct an extensive traffic measurement campaign in the Florence metropolitan area. Magenta will ask people to use their technology to set up traffic monitoring points from their windows, balcony or other vantage points to lay out a network of sensors of unprecedented coverage for this area, effectively setting up an integrated and participatory traffic monitoring initiative. At the end of the campaign, Magenta will release the collected data in order to promote the diffusion of actual information through social media or mobile applications, that will help to steer the public toward better, more sustainable mobility modes.